I was speaking to my cousin the other day & we were talking about Albino Deer. She has seen one, I have not. Though I hope to one day see one my chances are very slim to none, there are only 1 in 100,000 births that are Albino Deer. I find any variable in nature very interesting because I love different or usual things. I read a lot and love to check out natures beauty and the usual things that can occure in this great big old world. The Melanistic Deer is not something I had ever heard of let-a-lone ever seen. They are genetic phenomenon & more rare than the Albino Deer. 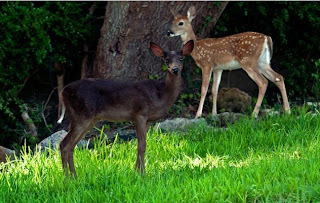 This would explain why there are so few pictures of the Melanistic Deer because there are very few sitings of such a deer. Looking on the net you might find a small hand full of them. If you ever see one make sure you snap a picture because chances are you may never see one again. Leave a comment tell me what you think? Have you ever seen an Albino or a Melanistic Deer? 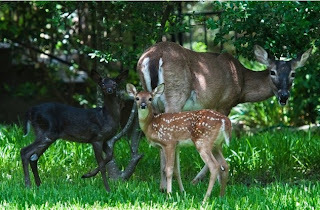 Even rarer than albino white-tailed deer are black, or “Melanistic,” white-tails. 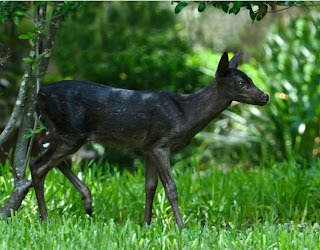 Photographer R. M. Buquoi took these photos of a Melanistic fawn near Austin, Texas. Snopes link that states this is in fact true.